Over the past few games in the Big East Conference play, the Hoyas have made strides to make something happen in the tournament, winning their last two games to get their 5th conference win of the season. Tonight they did a lot of the same good things against Xavier, who came into the game 24-4 on the season and 4th in the country, but in the end it was just not enough for the Hoyas to knock off the Muskateers. 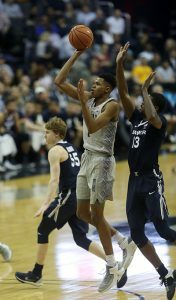 The win, which allowed Xavier to improve to 25-4 overall and 13-3 in the Big East, showed marked improvement for the Musketeers from their early February overtime win against Georgetown. For the Hoyas they had some problems getting the ball to their guards and the biggest highlight of the night came in the first half courtesy of Jormoko Pickett. Pickett’s 21 points (5 of 6 from 3-point range) and Jessie Govan’s 15 points, although Georgetown big Marcus Derrickson’s impact (nine points, 4 of 10 shooting) was mitigated by strong interior defense from the Xavier bigs. Today was the first of three home games for the Hoyas before they head to the Big East Tournament, which depending on the results of the next two games should have them playing in the first round of games on March 7th.